Green Deal Assessment: What You Should Expect – Initial Feedback. At the end of the Green Deal assessment your GDA will present to you the indicative findings and recommendations generated by the approved Green Deal Advice Report (GDAR) software, including the impact that your occupancy patterns and use will have on energy savings and the recommendations arising from the EPC. Your GDA will then explain to you the points on the Green Deal Assessment Checklist, answer any questions that you may have and inform you of who you can contact if you have any follow up questions once you receive your final Green Deal Advice Report. 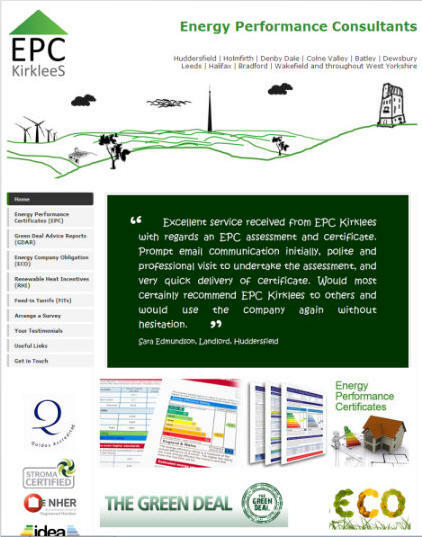 You can get further information and book a Green Deal Assessment simply by clicking on the EPC Kirklees image to the right.